Seminole Dolls: Seminoles were excellent woodcarvers. They made many things out of wood - homes, canoes. They also made dolls. They made two types of dolls. One was a little doll, about 2 inches tall. Each doll was dressed with fabric garments such as a Seminole woman or man would wear. The other doll was much bigger, perhaps 10 to 18 inches, and carved out of wood in an odd way. Everything was elongated as if you took a person and pulled them thin like taffy. It's a strangely attractive doll. 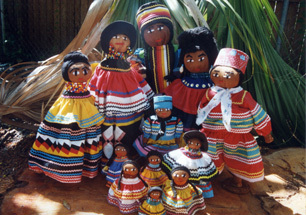 Today, Seminole artists make both types of traditional dolls.